Reliable, Dog training certified, Foster carer for Rescue Dogs. 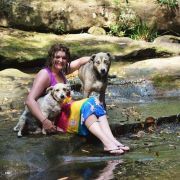 Need more information about Dog Training in Charlotte Bay NSW? Consistency – Our dog trainers stay close to your pup with Dog Training making sure their exercise is successful and watching out for their safety. When staying in a kennel your pup are sometimes left with very little individual supervision. Confidence – Finding a professional, reliable caregiver that you and your pup trust gives you confidence that your pet is in the best care. Our dog trainers make it their priority to get to know your pet, understand and look after their individual needs and provide a healthy time of exercise and play. At a kennel you do not usually have the same caregiver and might be leaving your pet with staff they have never even had contact with before. Freedom to Play – If you asked your pet what they looked forward to the most about the time with their dog trainer, we have no doubt, playtime, would be the emphatic answer. With our Dog Training your pet will get plenty of time outside playing with the dog trainer and other pets. The positive behavior, socialization and after effect of relaxation for your pet will make you both extremely happy with the results. Lower Risk – A dog trainer is able to be more selective in choosing the animals they allow in their home. This factor means your pup is much less likely to run into diseased, or aggressive pups when they stay with a dog trainer.